Ali, Salim, and S. Dillon Ripley. Handbook of the Birds of India and Pakistan, Together with Those of Bangladesh, Nepal, Bhutan and Sri Lanka. Vol. 10, Flowerpeckers to Buntings. Delhi: Oxford University Press, 1987. Bruggers, Richard D., Clive C. H. Elliott. Quelea quelea Africa's Bird Pest. Oxford: Oxford University Press, 1999. Craig, Adrian J. F. K. "Weaving A Story: The Relationships of the Endemic Ploceidae of Madagascar." In Proceedings of the 22nd International Ornithological Congress, edited by Nigel J. Adams and Robert H. Slotow. Johannesburg: BirdLife South Africa, 1984: 3063-3070. Fishpool, Lincoln D. C., and Michael I. Evans. Important Bird Areas for Africa and Associated Islands: Priority Sites for Conservation. Newbury and Cambridge, United Kingdom: Pisces Publications and BirdLife International, 2001. Fry, C. Hilary, Stuart Keith, and Emil K. Urban. The Birds of Africa. Vol. VII. London: Academic Press, in press. History of Madagascar. Chicago: University of Chicago Press, in press. Sibley, Charles G., and Jon E. Ahlquist. 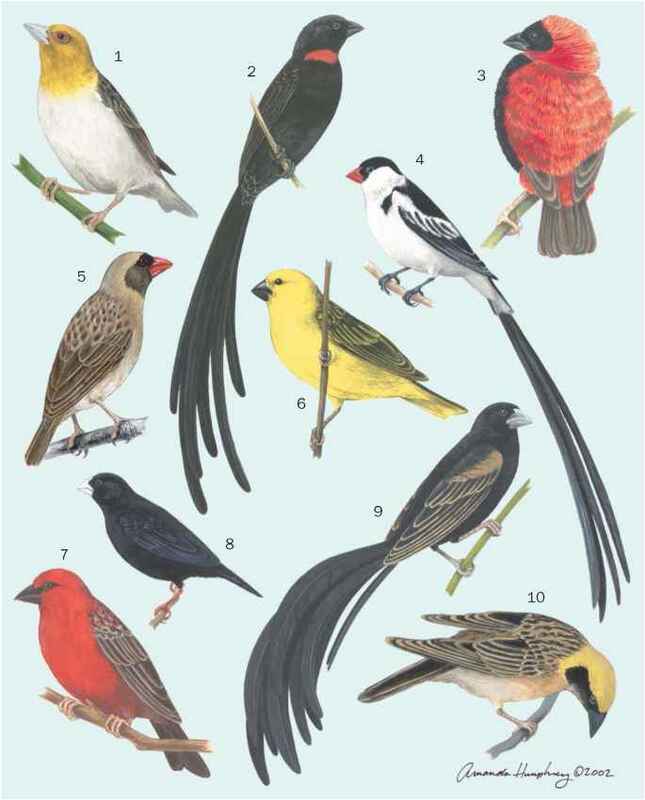 Phylogeny and Classification of Birds. New Haven and London: Yale University Press, 1990. Stattersfield, Alison J., and David R. Capper. Threatened Birds of the World: The Official Source for Birds on the 1UCN Red List. Barcelona and Cambridge: BirdLife International/Lynx Edicions, 2000. Andersson, Staffan. "Bowers on the Savanna: Display Courts and Mate Choice in a Lekking Widowbird." Behavioral Ecology 2 (1991): 210-218. Barnard, Phoebe. "Territoriality and the Determinants of Male Mating Success in Southern African Whydahs (Vidua)." Ostrich 60 (1989): 103-117. Brosset, Andre. "Social Organization and Nest Building in the Forest Weaver Birds of the Genus Malimbus (Ploceinae)." Ibis 120 (1987): 27-37. Collias, Nicholas E., and Elsie C. Collias. "Evolution of NestBuilding Behavior in the Weaverbirds (Ploceidae)." University of California Publications in Zoology 73 (1964): 1-162. Crook, John H. "The Evolution of Social Organisation and Visual Communication in the Weaverbirds (Ploceinae)." Behaviour Supplement 10 (1964): 1-178. Hudgens, Brian R. "Nest Predation Avoidance by the Blue-Billed Malimbe Malimbus nitens (Ploceinae)." Ibis 139 (1997): 692-694.